I'm considering creating some "ancient fish" figures as my first commercial offerings. Help me make some decisions about what you want! Last night I made some quick mockups of Amia calva to help me 1) visualize the sculptures, so I can better think about how much detail I can sculpt and paint at a given size, and 2) calculate volume for materials cost. I'll do a few more of these of other species. The first one is 5 inches (125 mm) long. Assuming a 30" (750 mm) specimen (which is big but not record-size), it would be 1:6 scale. The second is 2.5" (63 mm) long (1:12 scale). I have not yet calculated materials costs, but my hunch is that at these sizes, the cost of material will be minimal relative to the cost of labor- making molds, pulling casts, assembly, painting- which will be about the same for either size figure. If anything, working on the larger figure may be quicker due to being less fiddly. So, if you could have a 2.5" or a 5" figure at the same price, you'd want the bigger one, right? I help where I can, especially when I am selfishly invested! Personally, I think that sizing them all more or less the same may be a better choice. It keeps a consistency, and there is a precedent of making fish figures this way--Replica Toy fish makes all of the fish in the same sizes (in two lines, a 3" and a 6"). Yuijn of Japan also made some wide ranging fish sets, all of which were 3" or so as well. So maybe something in the middle, 4" to 5", a little larger for better detail, with maybe a few big ones to represent the big species? 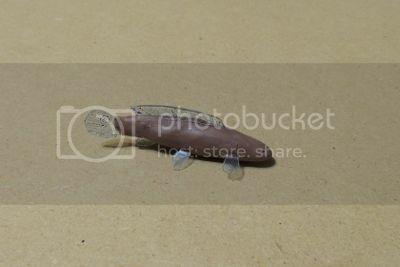 The only other Prehistoric Fish set that is really comparable would be the Colorata [ur=http://www.colorata.com/fs/colorata/figurebox/figurebox_es1l]Fossil Fishes Box. In that one, they are more or less the same size, with some variation that reflects the ones that are substantially larger (the group picture on the site reflects their comparative sizes). They kind of fall in between same-scale figures and same-size figures, kind of skirting both! And I guess there is also the question of bases/stands? Personally, I would say leave them with a small hole in the belly for people to mount them if they want to; or have them able to balance on their bellies. 1. 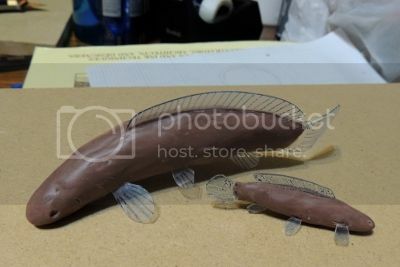 (shudder) Sacrifice a couple Polypterus species at the outset, maybe start with an ornatipinnis or senegalus; as I said, the only one that has ever been made is P. endlicheri, so skip that morphology for now. Although they are my favourite of all fish, but in terms of figures, it's probably better for a little broader variety. For now...Currently, I only have two live ones--an albino senegal and a delhezi, plus I have a teugelsi coming (polypterids have been a favourite since I was 12)! 2. Maybe just one of the Atractosteus for now? 3. Maybe skip the Neoceratodus for now, there are lots of figures of them, and none of the other lungfish at all. It's hard to thin out past that (yeah, what did I suggest? 5 fewer? not so much help)--so many that need to be done! But some of the families/groups could be represented by just one if need be. But that's what I think. Really, anything is good if they look good! Your argument for same size figures is convincing. I'll probably do it that way. So now I just have to figure out what size! What do you think of this more restricted list? 13 species. Not too big a number, I think! royal Chitala and clown Chitala, same sculpt different patterns. That's a good suggestion. I think there may be some more instances of this possibility among the bichirs and mormyrids, as well as the two species of Hiodon if I end up doing them (I like Hiodon, but honestly they look just like shad). If I assume a volume of 5 in3 for the larger model (which is an overestimate), it should take 0.19 lbs of Smooth-on 300 or 320-series urethane to cast the body (minus fins). A 1 gallon (15.4 lb.) kit of urethane will cost me just over $100 and would yield 77 casts of this size, for a cost of $1.34 per cast. I'd need about 50 in3 of silicone for the block mold; this would require 2.13 lbs of Mold Max. 1 gallon (11.5) lbs of Mold Max will cost me about $120, for a cost of ca. $22 for the mold. How much this will add to the cost of the model will depend on how many models I can sell. I'll be optimistic and say I can sell 30; that runs to $0.74 per cast. Casting the fins separately won't add too much cost. 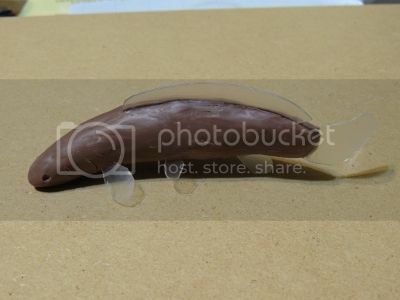 It's a negligible amount of resin, and the molds don't need to be flexible, so I can make them out of nice, cheap plaster. I'll have to pony up the upfront cost for the clear resin (Smooth-on doesn't list the price for some reason), but a small kit should last a long, long time. So far we have a materials cost of about $2.08 per model. Not too shabby! More important will be the labor required to sculpt, mold, cast, and paint each one, which I won't know until I start doing it. The startup cost is the biggest hurdle. I'll need about $400-500 worth of materials and a few pieces of equipment (digital scale, vacuum chamber) to start. Probably a total of $1000 to get going. My wallet is pretty flat at the moment, but I can at least get some sculptures done and ready to be cast once I have some cash in hand. So many responses to make.. In the sturgeons, I would suggest a different species, not because S. platorhynchus isn't interesting but because it was done by Replica Toy Fish! A pallid or sterlet would be a good sub! And I would think that the classic Elephantnose fish Gnathonemus petersii would be the best mormyrid. As far as the family goes, it is as familiar as they can be, and they are very unique looking. The rest of the shortened list looks good to me! It's sad to see some cuts, but what can you do? 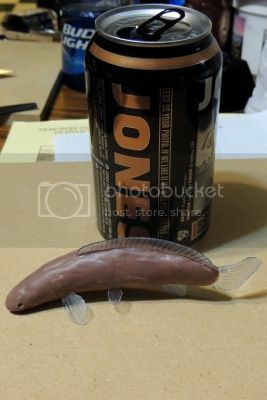 And as mentioned, some can be repainted to become new species (some of the polypterids, the gar, some knife fish, etc). I'm glad the line will go with a same-size bunch. Easier than making fish of different sizes fit a scale. As for the actual sizing, I guess it depends on the final price. Me, I like my figures somewhat smaller--if for no other reason, 13 5" figures would need a big shelf space! And the way fish are, they don't have the vertical variability of, say, dinosaurs or ungulates, so they all have to squeeze onto a space. I'm also thinking, as I said, that one of the other great things about these figures would be their use in dioramas and scenes. With big 5" figures, it's hard to find the corresponding other animals and plants to fit (imagine the size of the caiman needed to go with a 5" lungfish!). But a 3"-ish one opens up the possibilities. I am quite happy to spend the same amount on, say, small Kaiyodo figures as I would a large Safari fish, and I don't think I am alone in that--there are lots of Japanese-figure fans here (the Colorata being another good example). And they cost roughly the same (when priced fairly). BUT! It's your line. I am thrilled that anyone is going to do them at all, and in the end size won't matter (the only Bowfin I have is a 9" carved decoy, so it's not like larger figures are goiing to keep me away!). So if you, the sculptor and designer, are happier with making them larger, then go for it! I think that's all I've got for now...! Yay, Bowfin! Next step: get some more Amia reference material, then commence to sculpting! I'll try several iterations of this species in various sizes just to see what works best. I regret now not picking up all the bowfin carcasses I've seen along the banks of local reservoirs. Local anglers consider them "trash" fish and discard them on the bank if they catch them- along with drum, suckers, carp, and all the "ancient" fish. Maybe I'll luck out and find one this weekend. No luck so far. Hopefully this summer I'll have time to catch some of our local Beasts From The Depths of Time and get measurements and good photos. The images I've been able to gather thus far are just not enough to base a decent sculpture on. In the meantime, I'm going to sculpt some local amphibians. First up will be either Pseudacris crucifer, Hyla chrysoscelis, or Anaxyrus (=Bufo) americanus, all of which are calling around my house right now. I don't know if I'll try to produce these, but they'll be good practice. I've been meaning to ask how things are progressing. It's awesome how much research you are trying to do for it--might be trickier with some of the more exotic species, since it's either tougher or more expensive to get specimens! Yeah...it could become a problem. I don't think I need a specimen in hand for every species, though. I want to be as thorough as possible with the first figure, as I haven't sculpted a fish before. Hopefully after that one it will become a bit easier. I'd also really like to be able to observe a live specimen of each species I sculpt- preserved specimens and photos can be misleading. As far as that goes, the Nashville Zoo and the Tennessee Aquarium in Chattanooga have a pretty good selection of these fishes between them, and are within easy driving distance. Also...lampreys! They may not fit taxonomically, but you can't look into their beautiful little eyes and not want to sculpt them. They're going on the list! Newt, allow me to express an interest in buying a lamprey figure. I’ve been looking for one for a long time. Please let us know when available. Sure thing! It won't be soon, though; most likely next year. 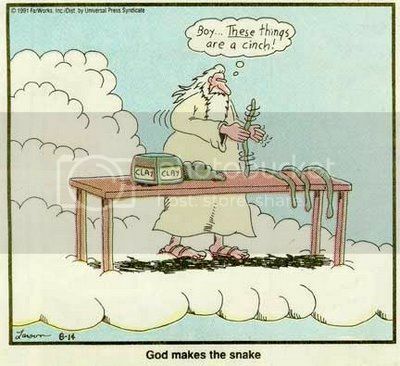 I have to second that--it just never occurred to me (maybe because I'm all pedantic and it's not really a fish?! ) But it's unbelievable that nobody has ever made one. Not even a sea lamprey? How bizarre. I don't know yet which species I'll do - it will depend on what I can get my hands on. I seem to come across Lampetra aepyptera more often than anything else, but maybe I can rustle up an Ichthyomyzon of some sort. They are commonly found on the larger riverine catostomids, such as buffalos and carpsuckers; maybe I should set some trotlines and see if I can catch a few suckers. Supposedly there is an undescribed neotenic Ichthyomyzon in a drainage just west of me...now that would be something! Meanwhile, I've got an American toad waiting for her portrait session. Depends what you mean by "fish", I suppose. The fisheries profession still maintains "finfish" and "shellfish" as the primary categories; you could make a case for mussels and crabs being as much "fish" as skates and salmon, not to mention jellyfish and starfish. You should see what some Catholics and Muslims have managed to convince themselves are "fish" in order to get around dietary restrictions - turtles, capybaras, and so on. It's funny how vernacular and taxonomic terminology tangle up. A lot of my biology friends tend to think the taxonomic use of a term is more correct than the vernacular ("Only Hemiptera are really bugs! "), but the vernacular use has priority on its side. I was going to say, using the phylogenetic meanings makes some words pretty much meaningless--like 'fish' itself. Technically, a group is defined by all organisms with a shared common ancestor plus their descendants (I think I mixed up my words...whatever). Therefore, a fish would be all organisms that share a common ancestor after the separation from sharks and kin, plus their descendants. Which in turn means that every tetrapod is a fish. Which means pretty much every vertebrate minus sharks and agnathans is a fish (and if you change the meaning of fish, then it's all vertebrates, etc). But, in general, when we say 'fish' most people know what we mean--swimmy things with gills and fins, not limbs. That aren't sharks or lampreys. Sorry to be so late, Newt, but hey, this is a brilliant idea! And the bowfin is an excellent species to begin with. Really cool . I hope to seethe final version . Thank you, brontodocus and Jetoar! SBell - you exclude Chondrichthyes from "fish"? I don't know that I've come across that distinction before. My preferred definition of fish: those animals commonly studied by ichthyologists. Nice, clean, arbitrary, cuts out all the fuzzy boundaries! Anyway, when I think 'fish' I tend to think of bony fish--chondrichthyans are, to me, different enough to be thought of separately as sharks (generically). I had a few thoughts (so easy, from the perspective of someone who doesn't have the skills required to actually make any of these) but I figure I'd wait to make sure that Newt was actually around to respond.